Chicory is a plant used both for food and for herbal medicine. Both the leaves and the root are edible, with the root usually used for medicinal purposes. Chicory root is also sometimes used to make a coffee- or tea-like beverage. However, not everyone should consume chicory root, and it is not recommended for pregnant women. Herbal medicines and teas may be natural, but that doesn't necessarily mean they are safe for pregnant women. Although chicory is on the generally recognized as safe, or GRAS, list of the FDA, some people should not consume chicory root. Chicory root is not recommended during pregnancy because it can bring on menstruation and cause an abortion, especially when taken at high doses. Chicory is sometimes used to prevent or treat cancer, upset stomach, gallbladder and liver problems, heart disease, loss of appetite, diarrhea and constipation. However, there isn't enough evidence to recommend chicory for any health condition, according to Drugs.com. 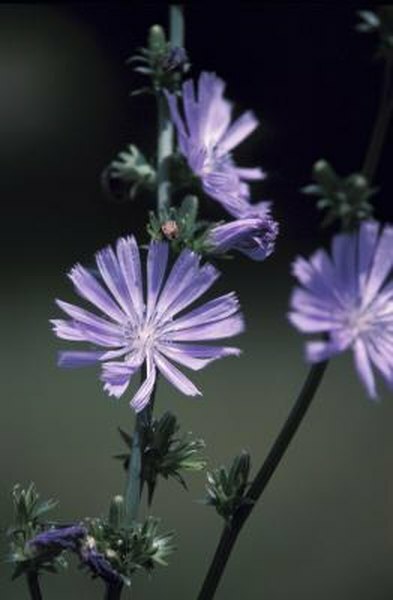 Clinical studies are needed to document the potential beneficial effects of chicory root. If you are allergic to ragweed, chrysanthemums, daisies or marigolds, you may also be allergic to chicory. Some people experience skin irritation when touching chicory. Although chicory is considered safe for most healthy adults, if you have gallstones you should avoid chicory consumption. Chicory root supplements may also be contaminated with bacteria or other toxic substances, according to Drugs.com. Speak with your doctor before taking any supplements, especially if you are pregnant, to determine whether they are safe. Due to the lack of evidence into the effectiveness of chicory and the potential harm from taking chicory-root supplements, it is not recommended if you are pregnant. Your doctor can recommend other treatments for any health condition you may have. BJOG: an International Journal of Obstetrics and Gynaecology: Herbal Medicinal Products During Pregnancy: Are They Safe?